From The Principia, First Law of Motion. Law I: Every body perseveres in its state of rest, or of uniform motion in a right line, unless in so far as it is compelled to change that state by forces impressed thereon. The word “perseveres” can be translated as “continues” to be more modern. Every student of introductory physics will have worked problems on the motion of projectiles (such as a thrown ball or a bullet), and will remember that the motion is resolved into two perpendicular components, the vertical motion accelerated due to gravity, and the horizontal component of motion which is always treated as uniform motion at a constant speed. Usually introductory problems allow simplification with the phrase “neglecting air resistance.” Little may the student realize that their teachers have so closely echoed Newton's words for centuries! 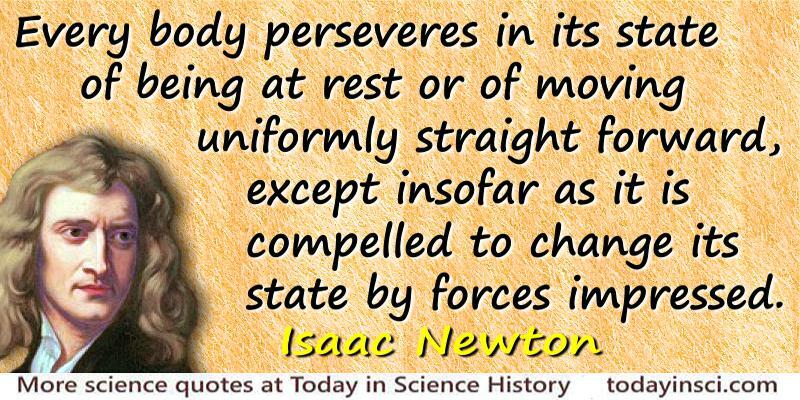 Also interesting is Newton's insight into the fact that outer space is free of resistance. No longer was it necessary to regard the motion of planets to be due to invisible winged angels pushing them along. 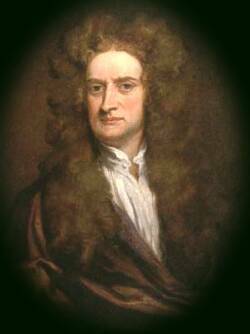 Now Newton explained they naturally retained their forward motion as a basic law of nature.